From the beginning of time, God has been a God of mission. When sin entered the world for the first time, God stopped resting and began pursuing. He began a mission to bring his people back to himself; to restore the earth to its rightful state. Everyone who has been rescued by God has now joined the force. So the church is not a group of adherents, but a family of missionaries! We are a force to be unleashed into the world, focused on the goal of God's will being done on earth as it is in heaven. This is the desire of Southside -- not to be consumers wanting spiritual services or pew-sitters who keep the status quo, but a family, led by God's Spirit, ready to spread out into the community and the world, bringing God's kingdom to those we meet there. We want to follow the pattern of God and the example of Jesus to be pursuers -- people who are constantly calling, rescuing, and wooing those who are oppressed and lost to come find rest in God. Ultimately, God's mission is for the whole world - every nation, every tribe, and every tongue - to worship Him. (Rev. 7:9). At Southside, we seek to take part in accomplishing that mission! Throughout the Old and New Testaments, one consistent description of God is that He is full of mercy. It is the first description God gives himself in Ex. 34:6. Paul uses the phrase "Father of mercies" in his doxology (2 Cor. 1:3). Most notably, God's mercy is demonstrated in His desire to send His Son to die for us on the cross -- the greatest act of mercy ever seen! When God's Son walked among us, his ministry was overflowing with mercy. He saw the crowds and had mercy on them (Mt. 9:36). He did miracles, fed the multitudes, and raised the dead all out of mercy. It drove his ministry. It was the beginning of his mission. In order to follow our God's footsteps, mercy must be a central component of Southside if it is to be a true church of Christ! What this means is developing a feeling of empathy and care towards other people. It means seeing in others what we once were without the gospel (1 Cor. 6:11). It means having a heart of compassion that wants to help others. It means extending loving hands of forgiveness to addicts, prostitutes, homosexuals, AIDS victims, as well as those who are wealthy or living with abundance. Simply put, it means being Jesus to others by being His hands and His feet. At Southside that is what we want to be a church that cares, helps, extends, forgives, and loves anyone who is in need. God's desire for his people has never been for them to stay where they are. He has always had a greater goal. In fact, ever since sin entered the world, his ultimate goal has been not to leave the world as it is, but to change it. As Jesus went about interacting with people, he did not sell them some goods or give a hand out; he wanted to change their lives! He wanted to reorient the priorities of a person's life around a different set of values. That is the point of God's Spirit within us: to start this remodeling process. It goes from the inside-out. A process that takes our old values, attitudes, and thinking and makes them into new ones. That is the call of the Great Commission as well. It is not to "Go and baptize." It is to "Go and make disciples." (Mt. 28:19-20) Disciples are learners, followers who have aligned themselves behind a Master. They have made the commitment not only to have their sins forgiven (although that is a part of the deal! ), but to learn how to be like someone named Jesus. At Southside we want to be a church that helps that process along. This transformation process is holistic in nature. It affects body and soul, physical and spiritual. It is rebuilding lives around the center of Jesus Christ. Transformation means offering Bible studies and job training. It means giving food and the Bread of Life. It means providing physical health care and spiritual health care. It means providing the means for one to live, not as a middle-class American, but as a faithful Christian in a stable, dignified manner. At Southside we want to be a church that offers people a new way of life by giving physical help they need and the spiritual rebirth they crave. "In the beginning, God created..." God is behind everything we see and hear. He created it good and beautiful. His crowning point is mankind, which He made in the image of God. Simply, man and woman were made to be in relationship with God. Sin came. Through the manipulation of a serpent, the first woman and man disobeyed God. Through this action, sin and its consequences came, driving a wedge between a tarnished creation and a perfect, holy God. God made a covenant. Instead of giving up, God made a promise to Abraham and formed His own people, Israel, so that through them, He might bless all people everywhere and restore the relationship. But Israel did not live up to the covenant. So God came. Doing the unthinkable, God became man in the form of Jesus Christ. He experienced life just like we do. He went among people preaching, healing, and teaching, showing that a new way of life could be found with God as King. Then, he died on a Cross, giving his life for the sin of mankind and showing us how to love. Three days later, he was raised from the dead, proving for all time that God has victory over Sin. A community formed. Followers of Jesus began proclaiming to the world the message of this Risen Savior. All over the world people began to respond to become a follower of Jesus as part of the grand plan of God. Their commitment to God was forged in baptism and consequently, a community was built that sought to fulfill the message and mission of Jesus. The curse still lingers. While the community following Jesus has grown, still it is imperfect. Despite the redemptive work of Jesus and His disciples, the world still feels pain, poverty, and heartache. We wait for Jesus to come back and bring a new heaven and earth. At Southside, we are a part of this Story. We seek to be a community of Jesus, a part of God's plan that is seeking to carry on Jesus' mission of mercy and transformation. We believe that God continues to add people to the church as they put on Christ in baptism, and we remember the life, death, and resurrection of Christ each first day of the week by taking communion together. We view Scripture as God's inspired Word and a worthy authority over our lives. We join other churches in seeking to restore the world back to God, and we wait patiently as well for Jesus to come back to fully restore this world someday! This congregation, under the name Southside Church of Christ, was established by Dr. I.L. Van Zandt and other elders, in a fast growing southern area of Fort Worth in 1892. Southside is now in its second century of service. Established to bring glory to God and to spread the message of Jesus, Southside has endured the test of time. At present, the Southside church is a mixture of young and old. For over 125 years, the congregation has served God by upholding the truth taught in scripture. 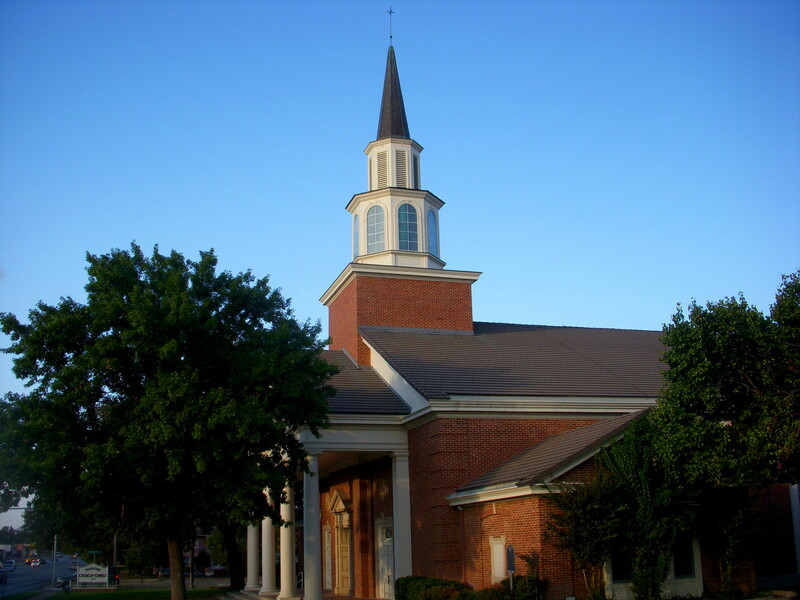 The congregation has served the community of Fort Worth by raising law-abiding citizens. The young that are under her influence are taught to respect the rights of others and to respect and obey the laws and those that are in authority. With God's help, Southside has trained and developed young boys to be preachers, elders and teachers. Southside has tried with success to strengthen "the home" among its members by discouraging divorce, infidelity, drinking, and doing drugs and other things that destroy the home as God would have it. For the future, Southside will continue to serve the community by dispensing food and clothing to the less fortunate, reaching out to all people regardless of race, color, or language, and working to be a light of Christ in the city around us. May God help the partners in the Gospel at Southside look forward to the challenges and opportunities ahead in the next 100 years. 1855 - The gospel was preached for the first time in Fort Worth by A.M. Dean, farm worker and preacher by night. The first congregation in Fort Worth consisted of nine members. 1876 - The congregation moved to a new building on the corner of 6th and Throckmorton. 1892 - A small frame building was erected signaling the birth of the Southside congregation. The first elders were Dr. I.L. Van Zandt, S.C. Jackson, Jim Alderman, W.S. Head, and H.G. Rollings. 1905 - Southside moved to another frame building at the corner of Jennings and Morphy. 1916 - A merger occurred between Southside and the Central-church. A new building was purchased at the corner of College Avenue and Leuda street. The building was enlarged at this location three times and in 1945 the membership was listed at 1082 persons. 1959 - Southside moved to its present location at the corner of Hemphill and Hawthorne streets. 1992 - Southside celebrated its 100 years of existence. 1994 - Mrs. O.P. Leonard unveiled a Texas State Historical Marker commemorating 100 years of existence as the Southside Church of Christ. 2010 - Dedication of the Mercy Wing on October 3, 2010. The 10,000 sq. foot addition helps those in our community who are in need of food and clothing and is an important ministry of our congregation and the Lord's work on earth. 2017 - Southside celebrated its 125 years of existence.